After a long day of work, I finally got round to taking outfit photos. Sorry for poor lighting. Today work was at the library... doing non-library tasks. I sat at a computer for 6 hours boo. 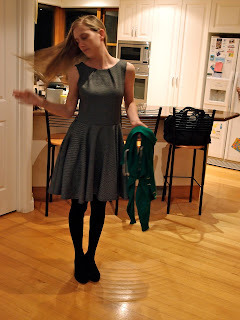 Me moving my hair, Charles took the photo right in the middle of the sweep! But that shows you the top of the dress. I really like the darts at the neckline. This dress has a very full skirt AND POCKETS, so it's my go-to dress for work.